Once Dimitri and I were on our own to furnish our condo in Vail, we had a great time working together. Our taste was remarkably similar. We decided on what we wanted for our entry hall--a difficult space. We wanted the area to be useful. At the beginning of the process we thought we wanted an armoire for coats. That kind of piece would have overwhelmed the entry hall (and we had a hall closet just around the corner). While we still employed the interior designer, she gave us some outrageously expensive suggestions for the space. Talking about our options, we decided we wanted a console table. We looked and looked for a console table that would fit in the space and could not find anything online or elsewhere. Another reason why we had trouble finding something already made that would work in entry, was because we wanted to have a bench underneath it for people to sit on to take off and put on their shoes. We also wanted drawers. Online we found designs of console tables that pleased us but did not have all of the features we wanted. Dimitri had the idea that the table should be a little higher than normal. We wanted a light colored wood because the space in the entry hall is small and the floor is dark wood. All of this conspired to result in our wanting to have a custom made console table. Another reason we wanted to have a custom made piece was because working with Jonathan Gerspach had been such a pleasure on our signature dining room table. https://www.etsy.com/shop/GerspachHandcrafted?ref=l2-shopheader-name and Jonathan's Facebook page at: https://www.facebook.com/GerspachHandcraftedWoodworks. We showed Jonathan pictures, talked about what we wanted and asked Jonathan to bid on a console table and bench. His bid was competitive with the ready-made console tables we were seeing online. And we would be able to incorporate all of the features we wanted to have. Jonathan suggested a light cherry wood. Jonathan promised to have the console table ready by the end of January 2014 when we wanted all of our furniture to arrive. Jonathan was again fun to work with. He kept us informed as to his progress and was basically on time with his delivery. Also importantly he was on budget. The finished console table was just what we wanted and was elegant, sleek and perfect for the space. We chose the fabric for the bench from Andres Garza's Vail Trappings in Edwards, CO. Jonathan had an upholsterer do the work. Jonathan kept us informed and we felt we were part of the creation process. The workmanship was impressive. 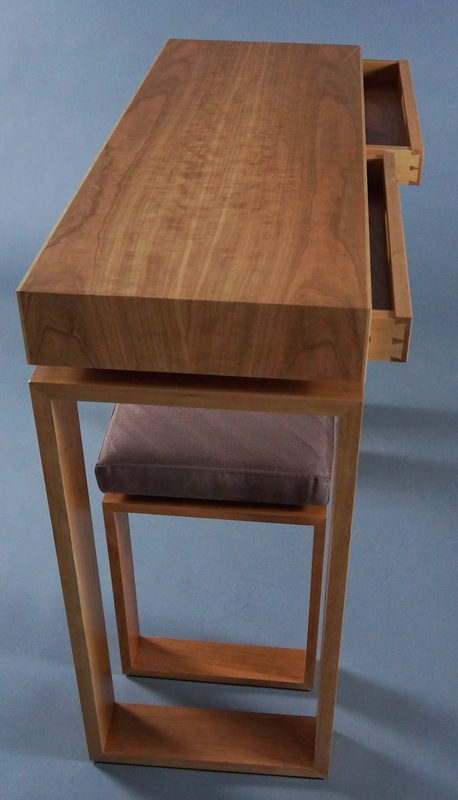 The drawers have "hand-cut dovetail" within the wooden drawer slide and are beautiful to see. Look at Jonathan Gerspach's workmanship! We were so pleased with Jonathan's work that we decided to have him make a sideboard for us for the hall across from the kitchen.